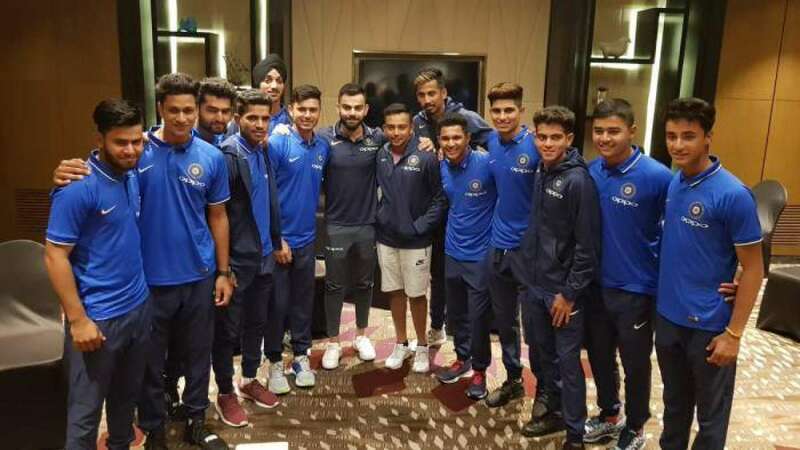 Mumbai : India captain Virat Kohli gave the national U-19 cricket team a quick pep talk here on Wednesday ahead of their departure for the U-19 World Cup. Kohli who captained India's successful team to the U-19 World Cup in 2008, praised current U-19 skipper Prithvi Shaw, hailing him as a special talent. Shaw has already scored five centuries in first class cricket and is expected to be one of the bulwarks of the Indian batting line-up at the U-19 World Cup which is scheduled to start in New Zealand on January 13. "I am also excited about Prithvi. I have heard a lot about him and Ravi Bhai (Shashtri) has also told me many things about him. He has had a lot of good performances in first-class cricket, which is rarely seen," Kohli told the media. "He has been made the captain ahead of the boys, who have played U-19, there is special ability in him, that we have seen," he added. Kohli also asserted that he has agreed to a request from India U-19 coach Rahul Dravid and will spend some with the boys and give them crucial advice ahead of their departure for New Zealad on Wednesday night. "Yes I will be meeting the U-19 boys after my press conference. Rahul bhai spoke to me and said that I should talk to them before leaving," Kohli said.